Dipropylene Glycol Methyl Ether / Methoxy Propoxy Propanol is a mid to slow evaporating solvent that has 100% water solubility and is ideally suited as a coupling agent in a wide range of solvent systems. This product has a higher flash point than Arcosolv PM / Dowanol PM, making it easier to handle, store, and ship. Dipropylene Glycol Methyl Ether / Methoxy Propoxy Propanol provides good solvency for a wide variety of resins including acrylic, epoxies, alkyds, polyesters, nitrocellulose and polyurethanes. Dipropylene Glycol Methyl Ether / Methoxy Propoxy Propanol has a relatively low vapor pressure (volatility) and evaporates at a slow rate. Key properties for coating applications include complete water miscibility and good coupling ability. Surface tension reduction and slow evaporation are some of the benefits of using Dipropylene Glycol Methyl Ether / Methoxy Propoxy Propanol in cleaning formulations. Dipropylene Glycol Methyl Ether / Methoxy Propoxy Propanol has a low odor and slow evaporation rate. 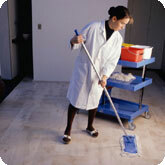 It is a good choice for wax strippers and floor cleaners, which are spread over a large area. When used in an enclosed area, a floor cleaner containing a fast-evaporating solvent might produce an undesirable amount of solvent vapor. Dipropylene Glycol Methyl Ether / Methoxy Propoxy Propanol provides good solvency for polar and non-polar materials. The properties listed in the previous section also support the use of Dipropylene Glycol Methyl Ether / Methoxy Propoxy Propanol in agricultural, cosmetic, electronic, ink, textile and adhesive products.